A modern Elizabeth Bennet might have very well admitted that she had a crush on Darcy the moment he entered the Meryton Assembly rooms, and then proclaimed that she had changed her mind when he slighted her. Today we call ourselves in love whenever we feel attraction or a heightened interest. What follows are mutual conversations, dates, moving in together, eventually marriage and divorce when we discover that what we used to call love is long gone or was never there to begin with. Consider how differently it had to appear to a Regency lady to whom any serious attachment had to have the notion of finality? Divorce was not an option. The moment she called herself in love her future was decided. Austen shows us the drawbacks again and again on the examples of failed marriages, of women mistreated by their husbands, of poverty, infidelity and ruin. Mrs. Bennet might be the silliest woman in the world, but she would be happier with a kinder husband. Mrs. Price might have been violently in love, but she pays the price every day of her life. Lady Elliot and Mrs. General Tilney must have been miserable. The day Maria Bertram decided to become Mrs. Rushworth was the first one of her ruin. Eliza Williams ended up as a prostitute. Mrs. Palmer and Isabella Knightley are Mrs. Bennet in making. Marianne would grow to be miserable with Willoughby if they married. Andrew Davies is frequently criticised for having Lizzy claim that she wouldn’t marry without the deepest love. As much as I dislike misconceptions about the novel created by adaptations, he couldn’t be more right here. Elizabeth Bennet’s attitude to love. That is a clear indication that what Elizabeth would be inclined to ever call love would have to be nothing short of the deepest attachment. Her love has to be fine, stout and healthy. It has to continuously grow and nourish, not fade away with time. It doesn’t mean that she was a stranger to the feelings of attraction, infatuation, or being in love throughout the novel. It means that the moment she will call it love will have all the significance of finality. Why does she need Pemberley to have it happen? They danced again; and, when the assembly closed, parted, on the lady’s side at least, with a strong inclination for continuing the acquaintance. Whether she thought of him so much, while she drank her warm wine and water, and prepared herself for bed, as to dream of him when there, cannot be ascertained; but I hope it was no more than in a slight slumber, or a morning doze at most; for if it be true, as a celebrated writer has maintained, that no young lady can be justified in falling in love before the gentleman’s love is declared, it must be very improper that a young lady should dream of a gentleman before the gentleman is first known to have dreamt of her. That a young lady should be in love, and the love of the young gentleman undeclared, is an heterodoxy which prudence, and even policy, must not allow. Austen might laugh at the thought that a young woman’s feelings could be kept under control to such an extent, but at the same time she was aware of the ramifications. For a young woman to fall in love without having her feelings reciprocated must have meant a broken heart, and even when she was assured of the mutuality of her affections, without the guarantee of their being rewarded by marriage, she could be as miserable as Elinor, Marianne, Fanny or Anne Elliot are throughout a good part of the novels. Elizabeth Bennet isn’t then eager to call herself in love before she knows it’s safe. Readers who see Lizzy as attracted to Darcy from the start aren’t wrong, because Austen describes a woman in love. Lizzy’s behaviour, her continuous interest in Darcy, her attempts at teasing and flirting, her fear of his rejection of her self are all too clear indications, but for all she knows he didn’t find her tempting enough. At first then she has no clear sign of Darcy’s interest in her or his willingness to follow his feelings. Then, after they discuss the flaws in their respective characters falling in love with him seems a dangerous move, and it is only safe for her to strive, by all means possible, to turn her feelings into hatred. Hunsford changes that, but at the same time crashes any hopes that could arise, because, as Lizzy tells Jane, Darcy has other feelings that should soon drive his affection away from her. It’s Pemberley where she learns it’s not the case, and only then she gives herself the chance to analyse her feelings. As for Elizabeth, her thoughts were at Pemberley this evening more than the last; and the evening, though as it passed it seemed long, was not long enough to determine her feelings towards one in that mansion; and she lay awake two whole hours endeavouring to make them out. She certainly did not hate him. No; hatred had vanished long ago, and she had almost as long been ashamed of ever feeling a dislike against him that could be so called. The respect created by the conviction of his valuable qualities, though at first unwillingly admitted, had for some time ceased to be repugnant to her feelings; and it was now heightened into somewhat of a friendlier nature by the testimony so highly in his favour, and bringing forward his disposition in so amiable a light, which yesterday had produced. But above all, above respect and esteem, there was a motive within her of good will which could not be overlooked. It was gratitude. — Gratitude, not merely for having once loved her, but for loving her still well enough to forgive all the petulance and acrimony of her manner in rejecting him, and all the unjust accusations accompanying her rejection. He who, she had been persuaded, would avoid her as his greatest enemy, seemed, on this accidental meeting, most eager to preserve the acquaintance, and without any indelicate display of regard, or any peculiarity of manner, where their two selves only were concerned, was soliciting the good opinion of her friends, and bent on making her known to his sister. Such a change in a man of so much pride excited not only astonishment but gratitude — for to love, ardent love, it must be attributed; and as such, its impression on her was of a sort to be encouraged, as by no means unpleasing, though it could not be exactly defined. She respected, she esteemed, she was grateful to him; she felt a real interest in his welfare; and she only wanted to know how far she wished that welfare to depend upon herself, and how far it would be for the happiness of both that she should employ the power, which her fancy told her she still possessed, of bringing on the renewal of his addresses. To a careful reader it’s obvious that she’s in love already. It’s been obvious on many earlier occasions, including her attempts at knowing him better, her not so “surprising” meetings with him in Kent and her inability to not think of him when she was travelling to Derbyshire, but what Lizzy does here is making sure it’s the deepest kind of love. Not fondness, admiration, attraction or respect, but her love of his self. It is a matter of honesty both towards him and herself that she would not encourage the union without being absolutely certain of it. Gratitude was considered the main reason for women’s falling in love. It was thought that a sensible (sensitive) woman could not remain indifferent to a man’s interest in her. Here, however, Lizzy is grateful yet for something else: for his loving her still. That is what makes the analysis of her feelings possible at all. That is the one factor that changes everything for her. For the first time she’s not in danger of falling in love unwisely. On the contrary. She is free to bring all of her previous feelings to light and define them. If she comes to a favourable conclusion she knows that there is a guarantee of their happiness on his part. She is aware that he waits for her to decide. Should she, at this point, jump to the conclusion “Oh, how wonderful! I love him!”? No! To paraphrase Darcy – a woman who felt less might. But for Lizzy it is of utmost importance to know for certain, to never regret her decision, to not marry a man who would make her unhappy, and to not make him unhappy in return. She knows her heart without a doubt as soon as regret comes and she thinks she won’t see him ever again. But at this point she knows that she has time, and she wants to give as much consideration to the decision as it deserves. It’s ironic that some readers assume that Lizzy was in love with Wickham, even though she herself decidedly objects to the idea, but don’t see Lizzy’s long and unwavering attraction to Darcy. It is not as if she were able to fall in love with him during the short time spent with him at Pemberley and in Lambton. Naturally it’s very easy to fall in love with a tall, handsome, clever and rich man who is crazy about us. I’d suggest it’s difficult not to fall in love with him. What Lizzy does then is trying to resist the temptation in order to define her feelings as if it didn’t exist. Note that she admits to her feelings long before she learns about his help to Lydia or his readiness to promote the marriage between Bingley and Jane. And yet she never voices them to anyone before his second proposal. Only then it is safe again, because, like many Austen’s heroines, Lizzy made the mistake of consciously falling in love too early. It’s just the beginning of the third volume and there is still a lot of anguish before her, while, the moment she admitted to loving him before herself was the point without return. Darcy too had his long nights spent on thinking about the nature of his affections for her. Whether his love was strong enough to give up all of the things that weren’t in her favour. An inclination unqualified, unalloyed by reason or reflection was not what he cared for either. To paraphrase Darcy again: to fall in love without conviction is not a compliment to the understanding of either. That is what Mr. Bennet did when he proposed to Miss Gardiner, and that, I’m sure, neither Lizzy nor Darcy would ever wish for themselves. Chawton: Friday (Nov. 18, 1814). I was certainly a good deal surprised at first, as I had no suspicion of any change in your feelings, and I have no scruple in saying that you cannot be in love. My dear Fanny, I am ready to laugh at the idea, and yet it is no laughing matter to have had you so mistaken as to your own feelings. And with all my heart I wish I had cautioned you on that point when first you spoke to me; but, though I did not think you then so much in love, I did consider you as being attached in a degree quite sufficiently for happiness, as I had no doubt it would increase with opportunity, and from the time of our being in London together I thought you really very much in love. But you certainly are not at all — there is no concealing it. Poor dear Mr. A.! Oh, dear Fanny! your mistake has been one that thousands of women fall into. He was the first young man who attached himself to you. That was the charm, and most powerful it is. Among the multitudes, however, that make the same mistake with yourself, there can be few indeed who have so little reason to regret it; his character and his attachment leave you nothing to be ashamed of. Upon the whole, what is to be done? [words omitted in Brabourne edition: “You certainly have encouraged him to such a point as to make him feel almost secure of you”] You have no inclination for any other person. His situation in life, family, friends, and, above all, his character, his uncommonly amiable mind, strict principles, just notions, good habits, all that you know so well how to value, all that is really of the first importance, everything of this nature pleads his cause most strongly. You have no doubt of his having superior abilities, he has proved it at the University; he is, I dare say, such a scholar as your agreeable, idle brothers would ill bear a comparison with. And now, my dear Fanny, having written so much on one side of the question, I shall turn round and entreat you not to commit yourself farther, and not to think of accepting him unless you really do like him. Anything is to be preferred or endured rather than marrying without affection; and if his deficiences of manner, &c. &c., strike you more than all his good qualities, if you continue to think strongly of them, give him up at once. Now, my dearest Fanny, I will begin a subject which comes in very naturally. You frighten me out of my wits by your reference. Your affection gives me the highest pleasure, but indeed you must not let anything depend on my opinion; your own feelings, and none but your own, should determine such an important point. So far, however, as answering your question, I have no scruple. I am perfectly convinced that your present feelings, supposing you were to marry now, would be sufficient for his happiness; but when I think how very, very far it is from a “now,” and take everything that may be into consideration, I dare not say, “Determine to accept him;” the risk is too great for you, unless your own sentiments prompt it. You will think me perverse perhaps; in my last letter I was urging everything in his favour, and now I am inclining the other way, but I cannot help it; I am at present more impressed with the possible evil that may arise to you from engaging yourself to him — in word or mind — than with anything else. When I consider how few young men you have yet seen much of; how capable you are (yes, I do still think you very capable) of being really in love; and how full of temptation the next six or seven years of your life will probably be (it is the very period of life for the strongest attachments to be formed), — I cannot wish you, with your present very cool feelings, to devote yourself in honour to him. It is very true that you never may attach another man his equal altogether; but if that other man has the power of attaching you more, he will be in your eyes the most perfect. I shall be glad if you can revive past feelings, and from your unbiassed self resolve to go on as you have done, but this I do not expect; and without it I cannot wish you to be fettered. I should not be afraid of your marrying him; with all his worth you would soon love him enough for the happiness of both; but I should dread the continuance of this sort of tacit engagement, with such an uncertainty as there is of when it may be completed. Years may pass before he is independent; you like him well enough to marry, but not well enough to wait; the unpleasantness of appearing fickle is certainly great; but if you think you want punishment for past illusions, there it is, and nothing can be compared to the misery of being bound without love — bound to one, and preferring another; that is a punishment which you do not deserve. Readers who are disappointed that love in Austen’s novel doesn’t resemble a lightning from heaven, or, in short, doesn’t resemble Marianne’s affection for Willoughby, don’t take under consideration how unwise that would be. How great the risk that a woman would follow an inclination not strong enough to last a lifetime. It does not mean that there was not such a kind of love in the heroines’ heart, but it means that what we call ‘love’ today wouldn’t be considered enough by them. They needed to know for sure, to make a decision as serious as marriage would be, before they even began the ‘dating’ process. We might think that it is enough that we feel dizzy in a man’s presence, that we’re ever conscious of him, that he makes us blush and remember his every word. But women back then (at least the wiser ones) still needed to take all of those feverish feelings and put them under careful scrutiny before they called it love. Then to translate it to our modern language we might say that Lizzy fell in love early in their acquaintance, but came to seriously love him at Pemberley. My manners must have been in fault, but not intentionally, I assure you. I never meant to deceive you, but my spirits might often lead me wrong. How you must have hated me after that evening? That’s Elizabeth’s admission that by now she realises that she gave him signs contrary to those she had meant to. She might have thought that she managed to dislike him and act on it, but her reactions to him were of a very different kind. Indeed, she did give him all the encouragement he needed to propose that evening. Those who are still in doubt should recollect that Pride and Prejudice is above all a novel about marrying wisely. About self recognition and deconstruction of one’s misconceptions. It is natural then for its heroine to be ignorant of the nature of her own feelings and in need of going through the necessary process of self discovery. Elizabeth herself admitted that after reading Darcy’s letter: I have courted prepossession and ignorance, and driven reason away, where either were concerned. Till this moment, I never knew myself. We are asked to change our opinion about everything we thought we knew at the beginning of the novel. That includes the nature of Lizzy’s feelings for Darcy as well. Should we really expect that Austen’s favourite heroine would want to marry for reasons other than the deepest love since her creator herself said that Anything is to be preferred or endured rather than marrying without affection? 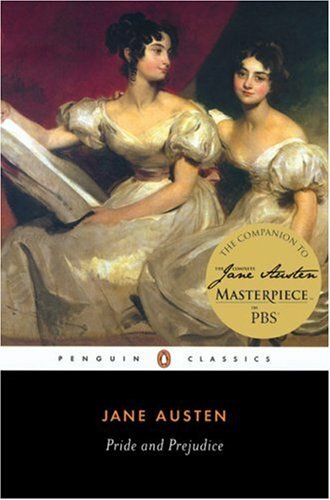 And even though it is Jane who says those words in Pride and Prejudice, and Lizzy at first jests on the subject, we are told that Another intreaty that she would be serious (…) produced the desired effect; and [Elizabeth] soon satisfied Jane by her solemn assurances of attachment. If that were not enough do remember that marrying without love (not fondness, respect or a fraternal or friendly affection, but the deepest sort of love that encompasses both its spiritual and carnal sides) was considered immoral by Austen’s times. Recall how low Charlotte sank in Lizzy’s mind after having accepted Collins. Any proper heroine back then would say that she was determined to marry only for the deepest love. I am the happiest creature in the world. Perhaps other people have said so before, but not one with such justice. I am happier even than Jane; she only smiles, I laugh. Apart from the last paragraph, I definitely agree with every statement in this post. It’s absolutely interesting. What about the last paragraph? I’ve always thought Lizzy’s reproach to Charlotte for marrying awful Mr Collins is a question of dignity, not moral judgement. She’s so angry with her best friend because she accepts to lose her dignity in a marriage of convenience. Lizzy would accept that compromise for no reason in the world. Lizzy would have married for nothing but the deepest kind of affection, as you’ve written in this post. Thank you! I’m glad you liked it and agree. I will cover Charlotte’s marriage in a much more detailed post one day. I agree that it is a matter of dignity as well, and personal happiness, for surely Lizzy would want Charlotte to be happy. However, Lizzy very clearly brings a moral judgement at some point as well, and Austen from the ON POV compares Charlotte to Wickham. There was a very significant change in people’s view on marriage of convenience around that time. The Church and the society had long struggled about it, and in the 18th century the Church’s view began to win over, leading to the notions of companionable marriage and romantic love that we know today. Marriages without love were likened to prostitution, so the charge was very serious. BTW When I try to open your site I get a virus warning. A link with ‘xoomer.virgilio.it/dreamsgraphic’ in it. Lizzy (and Austen) are fully aware how easily young women can fall in love with attractive young men. But there’s more to it – there must be some true regard – with which to respect and honour – which Mr Bennet singularly fails to have for his wife. Lizzy is mortified when she reads Darcy’s letter, not just because she sees starkly portrayed before her the faults of her own parents, but also her own, in becoming attached to Wickham without knowing his character. She failed to follow her own true principle. She allowed herself to be charmed. I’m not sure I agree that she was ‘in love’ with Darcy from the outset. One of the great qualities of P&P is how Austen slowly and by stages shows Lizzy’s feelings being inched towards love for him. But it is only when she knows his true worth, that he is just, honourable and kind, through his actions in finding Lydia that the door to her heart is finally opened. I agree that Andrew Davies is a good interpreter of Austen. There’s a scene at Longbourn, after she has read Darcy’s letter when, after some trivial conversation with him, she says to the camera ‘Go, I wouldn’t have you back again’. He isn’t worthy of her love, and her heart closes. Thank you for your comment, OF. I agreed with Davies on one thing. There are some others I don’t agree about, although, on the whole, I enjoyed the series. It’s not true that Lizzy’s heart is opened through Darcy’s actions in finding Lydia. At least in my copy of P&P it happens much earlier. About Lizzy being in love from the outset. I think it’s possible that we don’t disagree on that, only define the words differently. I posted another entry explaining the various stages of love, out of which ‘being in love’ is only the first one. But then I don’t think that one needs to esteem someone to fall for him. There are legions of women quite dizzy about Colin Firth for example, although not much is known about his character. 😉 It’s just an emotion, not yet a qualified feeling.